In 1983, one of All My Children's biggest fans asked the show's producer if she could be written in to the story line briefly. The role that was written especially for her was Verla Grubb, illegitimate daughter of Langley Wallingford. The fan was a legendary actress from television, film and, Broadway: Carol Burnett. Langley had been played for years by Louis Edmonds, who had previously worked in daytime television as Dark Shadows' Roger Collins. Ruth Warrick, one of the stars of the film classic Citizen Kane, played Langley's wife, Pheobe. Verla was the result of an affair Langley had with a snake charmer during his days working as a carnival barker, long before he arrived on the scene in Pine Valley. 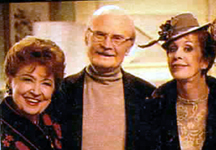 Carol's humorous performance blended well with the often comedic team of Edmonds and Warrick, as Langley struggled to keep Verla's identity a secret from Phoebe. After about a week in Pine Valley, Verla left, with Phoebe none the wiser. In a 1995 interview, Carol Burnett recalled her appearances on "All My Children" fondly. "I thought the idea of playing Langley's illegitimate daughter by a snake charmer was a hoot!" she said. "I told [All My Children creator Anges Nixon], 'That's absolutely wonderful. Let's do it.' That was when he was pulling the wool over Phoebe's eyes and all that, so it was fun, because I'd been watching the show and seeing him." 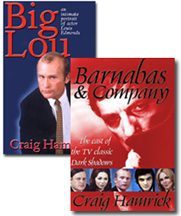 Carol said she found Louis to be quite personable, and a talented, well-trained actor. "What can I say? He's absolutely charming, and very pulled-together," she said. "I was impressed not only with how handsome he is, but how he took care of himself. He exercises and runs, and he's very conscious of taking care of himself, but not in a vain way. "That gives you a certain degree of confidence," she continued, "And he never missed a line or a trick, and I don't mean that in a derogatory manner." Before her brief stint on All My Children, Carol had appeared in a long-running television variety show and starred in movies and on Broadway. However, she found working on a soap opera to be a special challenge. "[Acting in a daytime drama is] very, very intense," she said. "I had something like 20 pages they would hand me to learn for the next day. You go from very early in the morning, with rehearsing, to then getting made up, to then doing blocking, to then getting ready to tape. And if you're in a lot of scenes, it can go on for 12 or 14 hours." "It's really tantamount to doing live television," she said. "They tape these shows, but they can't have the luxury of stopping if something goes wrong unless the scenery falls down, or somebody walks into a wall or something. "Because of the cost and because they have to grind it out every single day, everybody has to do their homework. And it's funny; it's instant acting. It's instant memorization. You have to just go in and barrel your way through it. Sometimes you're reading your lines right up until they say, '5,4,3,2,1...' and they say 'action,' and you hide your script under the cushion of a chair. Then when they say 'That's a print,' you grab your script to see what the next lines are that you have. "So I am absolutely amazed at the acting on daytime drama. If some of these actors were on the big screen, they'd win Oscars. These people are incredible." Carol said she admired Louis' acting ability. "He impresses me as having been classically trained," she said. "He gives [you] great confidence when you're playing a scene. He listens, which is, I think, the mark of a wonderful actor. He pays attention to what you're saying so that when he hits the ball back over the net, it makes that sweet sound." She said she grew very fond of him when they worked together. "I think that he's a gentleman, and you can put it as one word and then you can take it apart. He's a gentle man," Carol said.